“We want Lumpy, we want Lumpy, we want Lumpy…” This group chant has become very familiar at the Lumpy Waters Symposium, which took place in Pacific City, Oregon last weekend. This was my second year coaching at the event, and I had an absolute blast. The event started mid-day Friday, and I showed up a couple of hours early. 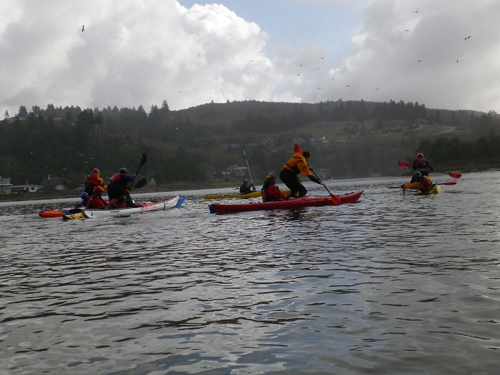 Sea kayaking symposia usually feel like a big family reunion, and it was great to spend some time catching up with old friends and making new ones before classes began. The Fun-Balance-Games class competes in a singing competition. Throughout the weekend I ran three sessions of Simplifying the Roll and one session of Fun-Balance-Games. It was great to work with coaches from all over the country, and fantastic to see so many repeat and new participants. There were races as well. Taking balance to another level. There were some very creative thinkers in this class. The social aspect of Lumpy Waters is one of the things that makes it special. Event sponsors, Thule and Kokatat, provided the beer, and Werner provided some REALLY nice stainless steel pint glasses to enjoy the tasty beverages out of. The campfire was always running strong, and evening social activities included presentations by Matt Nelson and Nick Cunliffe, as well as the legendary “Pub Quiz,” which is difficult to describe… guess you’ll have to go next year to experience it for yourself. Thank you to Paul Kuthe, Suzi Elle and Dave Slover who all do an amazing job of putting this symposium together. You all rock! Here in Northern California, Autumn is often the prettiest time of year. Foggy summer days are replaced by clear skies, and when not paddling, days can be spent at apple harvest festivals, corn mazes and pumpkin patches. In addition to all of this, the selection of fresh fruits and vegetables at farmers’ markets couldn’t be bigger. This is our favorite season, and we’re just at the beginning of it! Although “summer” is officially over, our schedule remains full for the rest of the year. It has been nice to spend some time at home though, catching up with friends, and when the ocean permits, exploring new places. 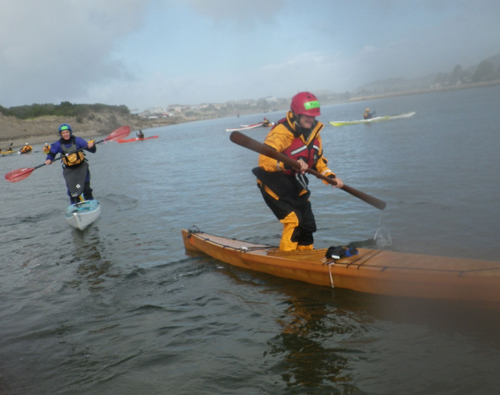 Helen spent another part of the month paddling and fishing with friends in Mendocino and Humboldt counties (both in Northern California). She also ran private rolling classes during the Bay Area Sea Kayakers’ Mendo Madness event, which takes place in Mendocino, California. Mark ran two introduction to sea kayaking programs, Simplifying the Roll and a combat rolling class, along with catching up with friends on and off the water in North Wales after the long summer. 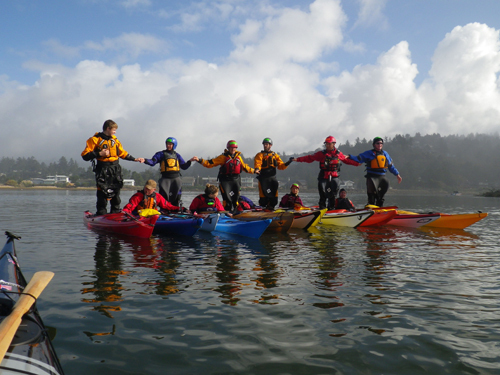 In October Helen will be instructing at Lumpy Waters in Pacific City, Oregon, Big Lagoon in California and at the Optimist Kayaking’s Symposium in Israel. 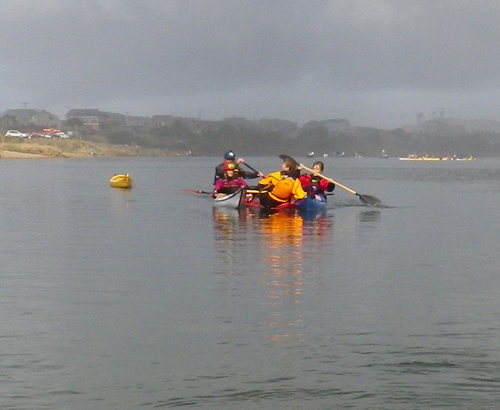 Mark will be working on a number of BCU classes, including a BCU 4 Star Sea Assessment and 4 Star Sea Training, as a well as providing some regional coach development programmes for Canoe Wales. Mark will also be one of the guest coaches at the DGI’s Autumn Coach Conference in Holbæk, Denmark. Later this year we have classes scheduled in the U.S. and Mexico. In December we’ll be meeting up with Wes Moses, and the three of us will attempt to circumnavigate Jamaica, the largest island of the Commonwealth Caribbean. To our knowledge, we will be the first people to attempt this circumnavigation. We plan to finish in late January.